The Work Sharp Culinary E5 electric kitchen knife sharpener uses controlled speeds and timed sharpening cycles to shape, sharpen and refine all your kitchen knives at the touch of a button. 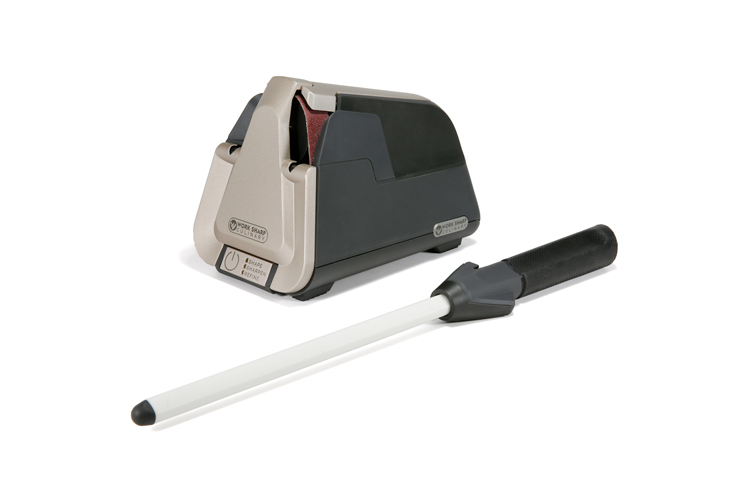 Exclusive to the E5 series, One Touch Programming has the sharpening knowledge built-in. Push to Shape, Sharpen, or Refine, and the E5 automatically adjusts speeds and running time to match the degree of sharpening desired. Sharpening guides eliminate guesswork and uneven sharpening. The included ceramic honing rod delivers a fresh cutting edge. The E5 electric sharpener uses a professional grade sharpening belt engineered specifically to sharpen knives without removing excessive material. The E5 Upgrade Kit (sold separately) expands the sharpening capabilities of the E5 with 15° East and 20° West sharpening guides.